The Advanced Diploma in Business Administration meets the needs of those wanting to gain a qualification which provides a firm grounding in business administration and a basis for the further academic study. This course focuses on the functional areas of management and administration within an organisation and how those disciplines integrated at the operational level, linking with the overall corporate strategy to achieve short, medium and long-term objectives. It identifies the essential characteristics of managing information systems, business analysis techniques, internal and external business structures, management control, financial management and management behaviour. It aims to develop learners’ critical thinking and problem-solving skills. Develop administrative skills to manage information systems within the organisation. Develop problem-solving techniques and critical thinking skills in a business situation. Demonstrate an understanding of the internal structure and external relationship for companies doing business at an international level. Demonstrate an understanding of the management control and planning. Examine the concept of entrepreneurship including behaviours, processes and skills relate to small business and enterprise. Manage budget and perform financial analysis to the organisations for effective decision making. Manage complex issues in the organisation to improve management practice. Perform environmental analysis for strategic marketing decision making to implement the strategy. Develop managerial and leadership skills to manage team performance. Gain knowledge about the advanced economic literature and legal systems in which business operate. Develop, test, implement and monitor a new project within an organisation. Understand human resource techniques and tools to manage employees’ performance and retention. Apply research methodologies for effective decision making. Develop an ability to analyse information and to identify a research question and to apply advanced research techniques and tools to create new literature which is justifiable and measurable. 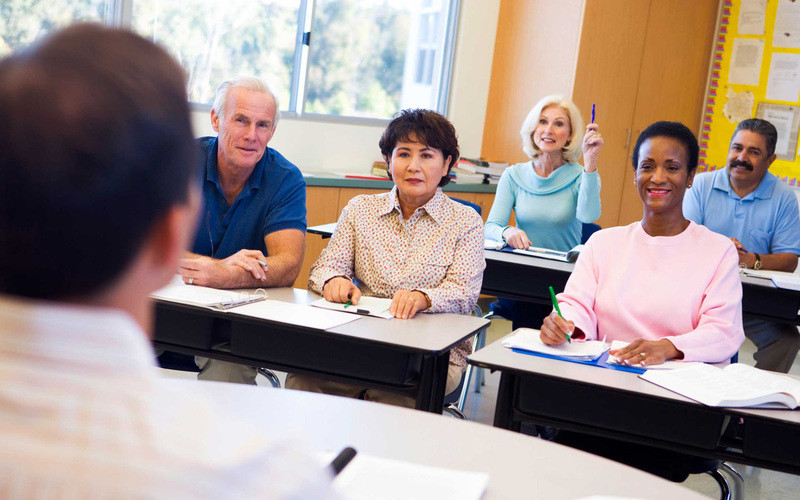 The overall structure of the course is based on 12 mandatory modules that cover a number of topics relating to learning outcomes. Each unit has the equivalency of 20 credits. Learners must complete all units successfully and achieve 240 credits before the Diploma can be issued. Total Qualification Time (TQT) to complete the full qualification is 2400 hours. While, Guided Learning Hours (GLH) refers to the amount of study undertaken by learners under the direction of their tutors and it includes tutorials, seminars, workshops, directed research, project or assignment. 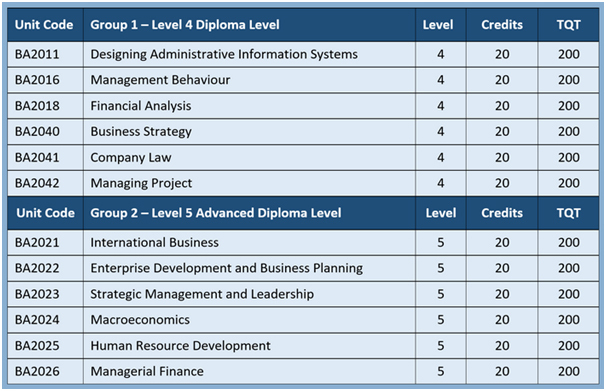 It is expected that a learner will need to complete following TQT against each unit to complete six units from Group 1 and six units from Group 2 to achieve the full Level 5 Advanced Diploma in Business Administration. Submitted assignments should be marked by an assessor. In order to pass a unit, a learner must achieve 40% marks in each assignment. Assessors must plan, gather and then assess learner’s evidence according to advanced diploma level descriptors’ requirements and on the basis of following generic marking criteria. These should be made available for internal moderation to the centre Internal Quality Assurer (IQA). In this case, you just have to pay Registration fee to EBMA. However, your study centre will charge course tuition fee. Progression onto EBMA Level 6 Graduate Diploma in Business Administration Leading to MBA at an advanced level or Certificate stage in Business related masters’ qualification. The Advanced Diploma in Business Administration provides range of knowledge and skills relating to international business, entrepreneurship, management and leadership, finance, marketing, business law, sales force management and research methods for managers. Graduate can utilise these skills to find a good and well paid job in all areas of management and administration. 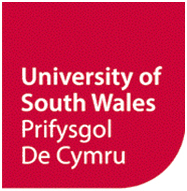 EBMA Level 5 Advanced Diploma in Business Administration is recognised by the University of South Wales for entry onto its BA (Hons) International Business Top Up degree (Direct Entry onto its Final Year). UK, EU and Non-EU (International) students are eligible to apply directly to the University. EBMA Level 5 Advanced Diploma in Business Administration is recognised by the York St John University for entry onto its BA (Hons) Business Management Top Up degree (Direct Entry onto its Final Year). EBMA Level 5 Advanced Diploma in Business Administration is recognised by the York St John University for entry onto its BA (Hons) Business Management and Finance Top Up degree.